When I was a teenager, I loved MTV and thankfully I came along in a time when music videos were played continuously on the channel. It was the early 80's and music videos were really coming into their own. Some might say that the king of music video was Michael Jackson and I wouldn't disagree. He broke through the color barrier on MTV and he made landmark music videos that he often called short films. I was a great fan of his work like many, many others and it was always exciting to see what he would come up with next! Michael Jackson made several amazing music videos throughout his career, but the quintessential, landmark video that he is remembered for is the one for his song "Thriller". It is a masterpiece and is firmly cemented in our cultural DNA. 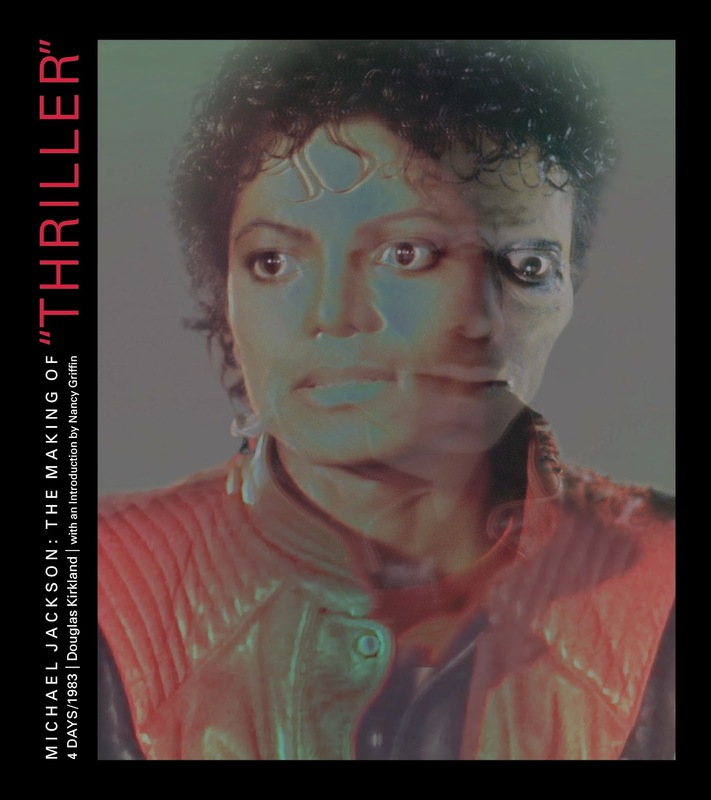 In Michael Jackson: The Making of "Thriller" 4 Days/1983 by Douglas Kirkland, published by Glitterati Incorporated, readers are given the opportunity to witness music history as the book follows the making of this epic music video. This superb video was directed by John Landis and the screenplay was co-written by him and Michael Jackson. In 2009, this groundbreaking music video was inducted into the National Film Registry of the Library of Congress, and is the first video to ever receive this prestigious honor. Douglas Kirkland's documenting of Michael Jackson during this creative process is a treat for any Michael Jackson fan, music lover, or film buff. It's a great behind the scenes adventure that shows the painstaking detail that went into bringing all of the moving parts of this production together. I love the hologram cover of the book because it shows the transformation from the music star Michael Jackson to his zombie alter ego from the music video. The book features dozens of photographs that show so much step by step detail that it makes you feel like you were there on the set during those days in 1983. Along with the numerous photographs, there are also interviews and quotes from musicians and celebrities who speak of Jackson's legacy and his influence upon music and popular culture as a whole. There are contributions from Sir Paul McCartney, Diddy, Beyonce, Steven Spielberg, and many others. Douglas Kirkland does an excellent job of bringing his amazing artistry as a photographer together with the artistry of Michael Jackson. Kirkland photographs Jackson in all of his glory as a musical icon, but he also captures him as an energetic, playful, hardworking, gifted human being. We were so fortunate to witness Michael Jackson's genius and Douglas Kirkland has done an exceptional job in showing us what pure creativity looks like. "Throughout his career Jackson's burning ambition to be the greatest kept him focused on his legacy. He once quoted Michelangelo as saying 'know the creator will go, but his work survives. That is why, to escape death, I attempt to bind my soul to my work. And that's how I feel. I give my all to my work. I just want it to live." "From the time he was a boy it was Michael's aim above all other things to transmit the joy he felt when he was singing and dancing. This was his gift to all of us, and it was huge and heartfelt. His music and his moves are eternal." It was a true joy to read this book and to look at all of the amazing photographs. I came away from it wanting to put more effort into everything that I do. What an amazing book! Michael Jackson: The Making of "Thriller" 4 Days/1983 can be purchased here.